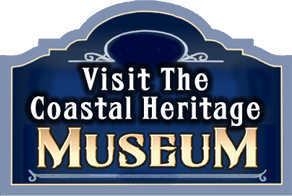 The Coastal Heritage Museum is a local history museum located in the old City Hall building at 532 N Citrus Avenue, Crystal River FL. The museum features an array of exhibits, artifacts, furniture and photos of the early history of the west side of Citrus County. 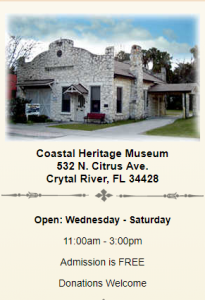 The Crystal River Heritage Council, a council of the Citrus County Historical Society, operates the museum with an all-volunteer staff. The City Hall was built in 1939 by WPA labor, the exterior is constructed of natural limestone quarried locally and interior ceilings are made from magnolia wood. This was the first permanent home for the Crystal River City Government and was used as city hall until the early 1970s. The building housed the Mayor’s Office, the Police Department, the jail and the fire truck. 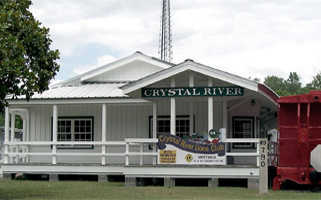 The building is owned by the City of Crystal River and has been home to the Coastal Heritage Museum since 1986. The building is listed on the National Register of Historic Places. 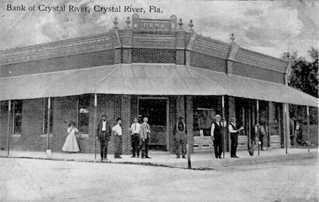 This is how the Crystal River Bank building looked at the turn of the twentieth century. The bank was located on the south side of the building and Edwards Brothers grocery was on the north side. 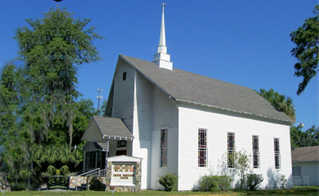 The Calvary Baptist Church structure is the oldest remaining church building in the city. It was built in 1889 by the First Presbytesrian Church. 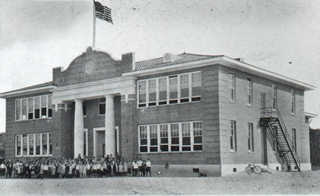 The Crystal River School was built in 1924 and served many different grades including high school. In 1968 a new high school was built on 8th Avenue and this became the middle school. In 1888, a spur track of the Silver Springs, Ocala and Gulf Railroad reached Crystal River. A fire destroyed the first depot building in the early 1900s and this Crystal River Depot was built soon after.